A stylish and contemporary coastal retreat which flanks the banks of the Hayle Estuary - a well renowned RSPB Nature Reserve. 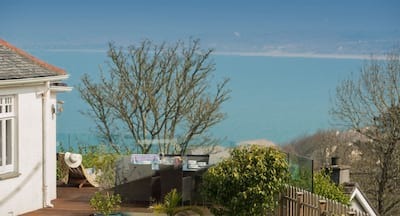 Sea and Sand is located in the much sought after area of Lelant Saltings, on the outskirts of St Ives, close to Porthkidney and Carbis Bay beaches. Three ground-floor boutique bedrooms offer indulgent accommodation for up to 6 guests, whilst the reverse-level layout ensures the ever changing estuary vistas are cleverly captured through the oversized glass frames of the first floor open-plan living accommodation. 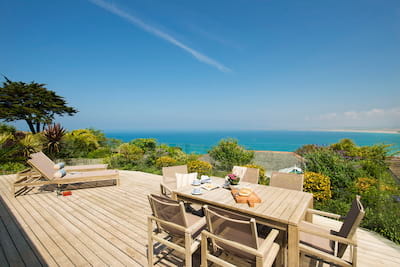 Architecturally crafted and interior styled, guests will undeniably enjoy the luxury and tranquility of its location - a private gateway to the beautiful coastal harbour town of St Ives and enviable base from which to explore breathtaking West Cornwall. Follow the single track road along the estuary bank to the quiet retreat of Sea and Sand. The unusual and striking architectural design flawlessly blends the elemental use of cedar and glass with its rural natural surroundings. Once inside, this reverse level two storey home is flooded with natural light, ensuring a great sense of calm that evokes the quiet waterside zen of The Saltings area. A spacious central hallway leads to each bedroom on the ground floor. The master bedroom sets the scene for your holiday relaxation. A generous and beautiful king bedded room dressed in stylish black with vibrant orange offers a tempting haven in which to switch off and relax, and within the master bedroom two single sofa beds offer additional accommodation creating a family room if required. Two further bedrooms are no less considered with each offering the finest bed linens and luxury twist. A large family bathroom and separate utility room complete the ground floor. A bespoke oak staircase leads to the lofty open plan living space of the first floor. To the rear a stylish fully fitted kitchen has been thoughtfully kitted out for all your holiday cooking from the state of the art Neff appliances to the smart crockery and kitchenalia. The breakfast bar with 2 stools is perfect for children. The large country kitchen table offers enough seating for up to 8 guests to dine and is perfectly placed under the oversized skylights for those skyward views. The hub to the house really is the generous living space. Pull back the tri-fold doors to the elevated balcony with comfortable seating, and wonderful tidal estuary views. Sea and Sand offers ample outside space. To the front is a large established driveway with attractive planted screening. The master bedroom offers tri-fold doors that slide back onto a courtyard, a quiet space to escape the buzz of holiday life on the ground floor. To the rear of the property a large patio area with outside seating is perfect for al fresco dining, whilst steps lead up to a large level lawn and hidden suntrap. The Saltings Nature Reserve is quite literally at your holiday door. Watch the birds take flight across the tranquil waters of the tidal estuary complimenting the peace and quiet of the area. Sea and Sand is a superb base from which to explore the west of Cornwall. Days can be spent discovering the breathtaking coastal paths or picture perfect Cornish villages as you head towards Land's End. The local branch line train is approx 2 minutes walk away and makes St Ives easily accessible. Enjoy the luxury of arriving in the town within 6 minutes as the track hugs the beautiful coastline. Hayle itself is a charming Cornish town much used by the local residents and brims with artisan shops and cafes. St Ives itself really is worth a visit. Enjoy boutique shops and chic harbourside dining, local boat trips in the summer and the art culture and heritage of the town. Three country pubs are all within walking distance. The golden sands of Porthkidney Beach are closeby and the amenities of Carbis Bay are within 1 mile. You can walk all the way to Carbis Bay and St Ives on the cliff-top path or as the tide recedes, along the sand, taking in the Cornish air and beautiful scenery. Sea and Sand comes highly recommended by the Gems team! Level access from ground floor to rear terrace. Approx. 9 steps to the lawn area. Sea and Sand offers a reverse level layout with the bedrooms on the ground floor and living space on the first floor. Please note that the balcony rail is just over 1m high. The balcony doors can be locked shut but young children should be supervised at all times. One internal flight of stairs with an open stair tread, please refer to the gallery of images. Due to the bespoke design, a stairgate cannot be fitted. Please note that the balcony rail is just over 1m high. The balcony doors can be locked but young children should be supervised at all times. Please feel free to contact our travel advisors on 01872 241241 for further details on the suitability of Sea and Sand for younger children. Due to the bespoke design of the staircase, a stairgate cannot be fitted at the top or bottom. Please refer to the gallery of images to detail the staircase location within the first floor. A superb house in a fantastic location right on the edge of Hayle estuary. A fantastic place to watch wildlife. Lots of pubs and restaurants within easy reach and walks to local beaches only 10 minutes away. What a beautiful home! As previous guests have said, so well-equipped and clean. Really felt like home. Fantastic location – close to so much. Tranquillity absolute. Thank you for allowing us to share your special abode. Beautiful property in a wonderful position. Very lovely setting, included all basic amenities in the kitchen, there were BBQ & picnic catering essentials as well. But overall is a great location to the train station & walk to one of the cleanest turquoise water beach with golden sand. We had a fantastic holiday. The service was first class, both before arrival and during our stay. The house was very well equipped and in a beautiful location. This is the second time we have used Cornish Gems and our second visit to the same property! Sea and Sand is an excellent property which is very clean, well maintained and comfortable. Once again, we found it difficult to return the key at the end of a very relaxing holiday! A lovely property in super surroundings. It was extremely well equipped and everything and more that we could have asked for.